Typically, words that identify more than one person, place, or thing are made plural in the English language. Collective nouns are an exception. This unique class of nouns denotes a group of people, animals, objects, concepts, or ideas as a single entity. Once you review a few examples, you'll know exactly what these nouns are all about. Things start to sound really technical when we discuss countable, mass, and collective nouns. Let's clear some of that up right now. Countable Nouns - These nouns can be counted by a number or quantified by size. They appear in both singular and plural form. Mass Nouns - These nouns are also referred to as uncountable or non-count nouns. They signify unbounded amounts, such as of liquids, small objects, and abstract or immeasurable concepts. For example, "water," "rice," and "education" can all be considered mass nouns. A noun is considered a mass noun when its use can't be counted, modified, or quantified in a relevant manner. Collective Nouns - These are a subset of count nouns because they refer to a group of countable nouns as a unit. For example, there are 12 eggs in dozen and 52 cards in a deck. Nouns in the collective class can be used in either the singular or plural form, depending on the context of the sentence. 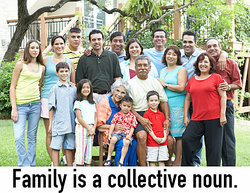 For example, "family" is a collective noun because it refers to more than one person sharing a relationship. However, you can also use this in its plural form to refer to groups of families. Using collective nouns in sentences can be confusing because it's sometimes difficult to discern whether to use plural or singular verbs and pronouns. To use verbs and pronouns correctly, identify whether the collective noun refers to a group working as individuals or in unison. When the unit is acting in unison, it is appropriate to use the singular. When the members of the unit are acting as individuals, it is appropriate to use plural forms of verbs and pronouns. The class waits [singular verb] for its [singular pronoun] teacher quietly. The class begin [plural verb] their [plural pronoun] homework assignments while they [plural pronoun] wait [plural verb] for their [plural pronoun] teacher. When group nouns signify units acting as individuals rather than in unison, it is also appropriate to add or replace words to create reference to the individuals - for example, adding the word "members" after collectives like board or committee, or inserting "players" for "team" or "students" for "class." Many singular nouns have very unique collective forms that pertain specifically to that term. While most people are familiar with the more commonly used collectives, such as a class of students or crowd of people, there are a large number of less common collectives, such as an eloquence of lawyers. It's interesting to learn what the appropriate collective forms of various nouns are. Teachers, students and lovers of the English language may find it entertaining to list the rarely used, original collectives, use them in fun or ironic ways, or come up with new terms. Like most linguistic developments, collective nouns have developed through time as a result of many different situations. For example, terms of venery, those nouns used to signify groups of animals, developed from medieval hunting language. Experienced hunters were educated in discussing groups of animals in specific collective ways, sometimes in reference to the animal's activities or habits. Uses of these fanciful phrases distinguished upper-class gentry from lower-class agricultural workers. "Collective Nouns." YourDictionary, n.d. Web. 24 April 2019. <https://grammar.yourdictionary.com/parts-of-speech/nouns/Collective-Nouns.html>. Typically, words that identify more than one person, place, or thing are made plural in the English language. Collective nouns are an exception.This unique class of nouns denotes a group of people, animals, objects, concepts, or ideas as a single entity. Once you review a few examples, you’ll know exactly what these nouns are all about.